The sfc scannow option is one of the several specific switches available in the sfc command, the Command Prompt command used to run System File Checker. While there are plenty of different things you can do with the command, sfc /scannow is the most common way that the sfc command is used. Sfc /scannow will inspect all of the important Windows files on your computer, including Windows DLL files. If System File Checker finds an issue with any of these protected files, it will replace it. Open Command Prompt as an administrator, very often referred to as an "elevated" Command Prompt. 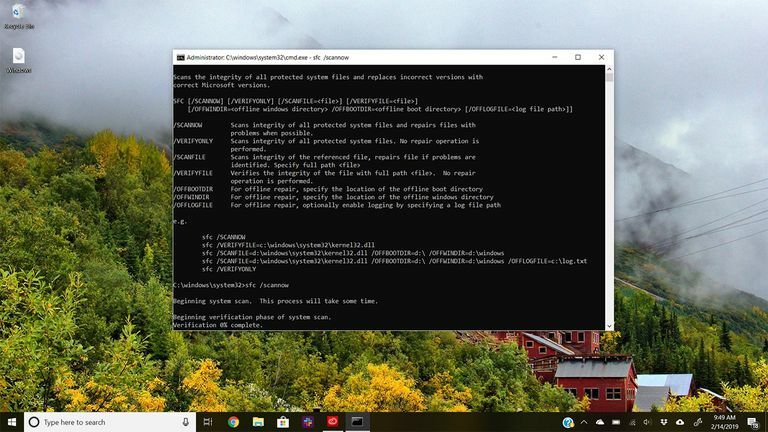 For the sfc /scannow command to work properly, it must be executed from an elevated Command Prompt window in Windows 10, Windows 8, Windows 7 and Windows Vista. This is not required in previous versions of Windows. There's a space between sfc and /scannow. Executing the sfc command with its option next to it (without a space) might result in an error. If you're trying to use System File Checker from the Command Prompt available from Advanced Startup Options or System Recovery Options, see the Executing SFC /SCANNOW From Outside of Windows section below for some necessary changes in how you execute the command. System File Checker will now verify the integrity of every protected operating system file on your computer. It might take quite a while to finish. Windows Resource Protection found corrupt files and successfully repaired them. Details are included in the CBS.Log windir\Logs\CBS\CBS.log. For example C:\Windows\Logs\CBS\CBS.log. Note that logging is currently not supported in offline servicing scenarios. In some situations, most often in Windows XP and Windows 2000, you may also need access to your original Windows installation CD or DVD at some point during this process. Restart your computer if sfc /scannow did actually repair any files. System File Checker may or may not prompt you to restart but even if it doesn't, you should restart anyway. Repeat whatever process caused your original problem to see if sfc /scannow corrected the issue. Every time you run System File Checker, a LOG file is created that contains an itemized list of every file that was checked and every repair operation that took place, if any. Assuming Windows is installed on the C: drive (it usually is) then the log file can be found at C:\Windows\Logs\CBS\CBS.log and opened with Notepad or some other text editor. This file could be useful for advanced troubleshooting or as a resource for a tech support person that might be helping you out. See Microsoft's How to Analyze the Log File Entries Created by SFC article if you're interested in diving into this file yourself. When running sfc /scannow from outside of Windows, like from the Command Prompt available when you boot from your Windows installation disc or flash drive, or from your System Repair Disc or Recovery Drive, you'll have to tell the sfc command exactly where Windows exists. The /offbootdir= option specifies the drive letter, while the /offwindir= option specifies the Windows path, again including the drive letter. Depending on how your computer is configured, the Command Prompt, when used from outside of Windows, doesn't always assign drive letters in the same way that you see them from inside Windows. In other words, Windows might be at C:\Windows when you're using it, but D:\Windows from the Command Prompt in ASO or SRO. In most installations of Windows 10, Windows 8, and Windows 7, C: usually becomes D: and in Windows Vista, C: is usually still C:. To check for sure, look for the drive with the Users folder on it - that will be the drive Windows is installed on, unless you have multiple installations of Windows on multiple drives. You can browse for folders in Command Prompt with the dir command.